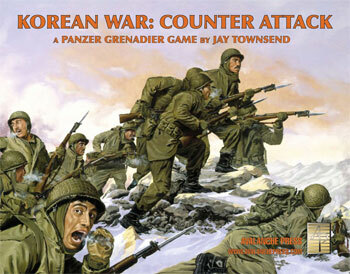 Despite a lack of armor support, at least in the early stages of the Korean War, the U.S. Army managed to blunt the North Korean assault and then launch a successful counter attack that nearly overran all of North Korea. One factor in this American success was a copious supply of support weapons other than tanks that provided the massive firepower so essential to the American way of war. Known as “the infantry’s hand artillery,” the recoilless rifle entered combat at the tail end of World War II. A recoilless rifle vents its propellant gases near the breach, greatly reducing the weapon’s recoil. The M20 75mm recoilless rifle only saw limited action in 1945, but had a very positive reception and by 1950 formed an important part of the American infantry arsenal. 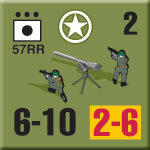 The 75mm recoilless rifle took the place of anti-tank guns in the battalion heavy weapons company; it was not as effective against enemy tanks as the Super Bazooka but very effective as a direct-support weapon. At 115 pounds, the weapon could be moved by hand rather easily; the 75mm pack howitzer, by contrast, weighed in at over 1,400 pounds. 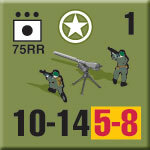 Even easier to transport was the M18 57mm recoilless rifle; at just 48 pounds, it could be fired from the shoulder. Each rifle company had three of these weapons as part of their weapons platoon. The M18 had a limited anti-tank capability but was useless against the T-34/85; balancing that, it had a very effective high-explosive round. I wasn’t sure about the designer’s decision to break out the 57mm recoilless rifle from the weapons platoon. After some thought I think it’s the correct decision, else we’d have a weapons platoon of unusually large firepower that now represented three distinct weapons systems (recoilless rifles, machine guns and light mortars), one of which had (limited) anti-tank capability while the others did not. The United States fielded outstanding artillery during the Second World War, and in 1950 the same weapons remained the backbone of the American way of war: if something gets in your way, blow it up. The 105mm M2 howitzer entered American service in 1934, remaining in front-line use for three decades afterwards (a few of them soldiered on into the 1970’s; some are still used by foreign armies). Reputedly this weapon killed more enemy soldiers in World War II than any other. It featured good range, accuracy and mobility, and armed three light artillery battalions of each infantry division (each in turn of three batteries of six guns apiece). Over 10,000 of them were built. 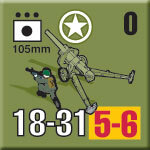 These units rarely appear on the game board in Panzer Grenadier scenarios, usually making their presence felt as part of the awesome American off-board artillery strength. But in Counter Attack we have the Battle of Bloody Gulch, in which North Korean troops overran two American artillery battalions. To move their new artillery pieces, the U.S. Army commissioned a series of powerful tractors to serve s prime movers. By the end of World War II the most common had become the M5 High Speed Tractor, a vehicle based on components of the M5 Stuart light tank. Like many American support vehicles, it came with a .50-caliber machine gun. The “Tractor, High Speed, 13 Ton, M5” entered American service in 1942 and proved very effective, but more and more difficult to maintain with the M5 light tank out of production. By the latter part of the Korean War the similar M8 High Speed Tractor based on the M41 Walker Bulldog light tank began to replace the M5 in service. 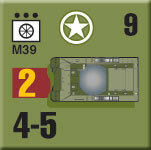 The M39 Armored Utility Vehicle first appeared in the latter stages of World War II, and saw use as an armored personnel carrier, ammunition transport and medical evacuation vehicle. 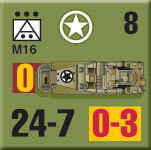 The M39 was simply an M18 tank destroyer with its turret and ammunition stowage removed; about 650 of them were converted from tank destroyers. Armored infantry units did not deploy to Korea, and the otherwise-ubiquitous M3 halftrack saw little use there. The Sikorsky H5 helicopter, known to the U.S. Navy as the HO3 “Horse” and the British as the S-51 Dragonfly, began production in 1945. A relatively small machine, the H5 was an enlarged version of the R4 with a bigger rotor and a stretched fuselage to allow a two-man crew. The Army initially ordered the H5 to serve in casualty evacuation, with two stretchers slung in racks amidships and one more at the rear of the fuselage; the second-seater would usually be a medic rather than a spotter. He had access to the forward casualty compartment, but not the stretcher in the rear of the aircraft. Later versions could carry three passengers on a bench seat behind the cockpit, but they could only bring the clothes on their backs. The machine had a high center of gravity and flew badly once its passengers had been off-loaded; H5 helicopters were issued iron weights in canvas sacks, which were thrown overboard when passengers boarded. This worked well for one flight and one flight only; afterwards the aircrew had to improvise their own ballast. 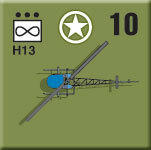 During the Korean War the H5 also rescued downed pilots and served as a reconnaissance bird, the role it plays in Panzer Grenadier. 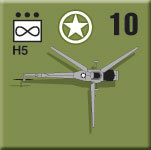 The Army apparently intended to include one helicopter in each infantry regiment’s order of battle, but those units which did receive an aviation element appear to have operated fixed-wing aircraft, with all of the regimental aircraft informally gathered in a divisional aviation company. The H13, better known as the Bell 47, is the well-known “M*A*S*H Helicopter.” It entered American service in 1945, continuing until the early 1960’s when the OH-6, known as the Loach, took its place. 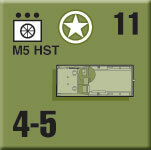 Like the H5 it was used in casualty evacuation and to a limited extent as a reconnaissance machine. Helicopters took a much smaller role in the Korean War than they would a little over a decade later in Vietnam for a simple reason: the U.S. Army was still allowed to operate fixed-wing aircraft, though they had to fall under certain size and weight restrictions. That changed in 1964, when all fixed-wing aviation was transferred to the U.S. Air Force, and the Army filled the legal gap with rotary aircraft. The North Koreans operated Soviet-made Sturmovik ground-attack planes, but enemy air attack was rarely a danger for American troops during the Korean War. 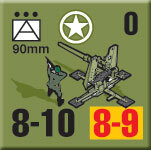 The U.S. Army went into the Second World War with a massive anti-aircraft establishment, and ended up re-directing many of the troops and vehicles from those units to other duties (infantry replacements and the Red Ball Express) when the German Luftwaffe proved unable to mount a threat to American ground targets. Anti-aircraft battalions had been independent units attached to infantry divisions during World War II; by 1950 they had become an organic part of the division. The big 90mm anti-aircraft gun was cumbersome to maneuver, and its early model could not be depressed low enough to battle enemy tanks. The M2 model, introduced in 1943, not only could be depressed to battle enemy armor but allowed quick emplacement. It came with a large shield for the crew, and an automatic rammer allowing a high rate of fire. A handful of 90mm weapons on an experimental anti-tank carriage made it to Korea with the 187th Airborne Regimental Combat Team, but proved too heavy to be air-dropped and were judged a failure. While the M16 “Meat Chopper” had been introduced as an anti-aircraft system, by 1950 it had little effectiveness against aircraft but remained a potent ground-support weapon, particularly against Chinese human-wave assaults. The M16 was an M3 halftrack with four .50-caliber machine guns fitted to a common pedestal mount. It proved highly popular with the infantry during the Korean War, and as so often the U.S. Army responded by ordering it removed from service in 1951, though many units seem to have lost that memo. Mike Bennighof is president of Avalanche Press and holds a doctorate in history from Emory University. A Fulbright Scholar and award-winning journalist, he has published over 100 books, games and articles on historical subjects. He lives in Birmingham, Alabama with his wife, three children and his dog, Leopold. Leopold likes to bark.